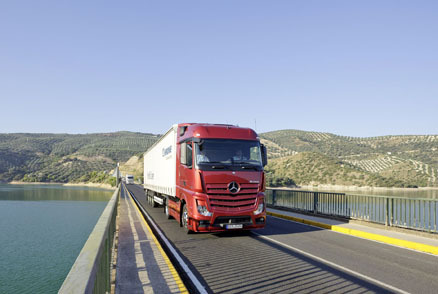 Mercedes-Benz's New Actros has been elected International Truck of the Year 2012 by the 24-strong jury of commercial vehicle journalists, representing 24 countries throughout Europe. With a total score of 161 votes, the new German heavy-duty truck fought off the challenge posed by the Czech-built Tatra Phoenix off-road, all-wheel-drive range, which collected 67 votes. Scania's Euro 6 range ?nished in third place with 50 votes. According to the ITOY rules, the annual award is presented to the truck launched in the previous 12 months: "Which has made the greatest contribution to road transport ef?ciency in terms of innovation, comfort, safety, driveability, fuel economy and lowering exhaust emissions." Mercedes-Benz's performance comes just a year after its Atego medium-duty truck scooped the ITOY 2011 Gold at the IAA Show in Hanover. And it's the fourth time that the Actros has won the ITOY award altogether. Its ?rst victory was in 1997 then, with the second generation, it won again in 2004. 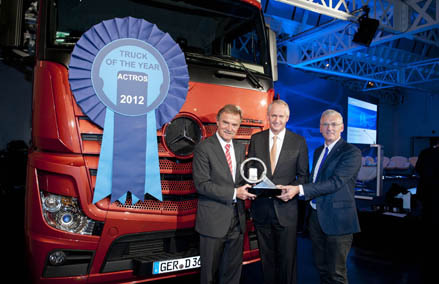 And in 2009 the third generation Actros made it an impressive triple win for the German truck manufacturer. The New Actros is a truck that's both revolutionary and evolutionary. The revolution part lies in a superb blend of improved driveline-technology and cab aerodynamics that neutralise the effects of Euro 6 on fuel consumption, one of the biggest concerns for road transport operators both now and for the future. Georg Weiberg, Head of Truck Product Engineering; Hubertus Troska, Head of Mercedes-Benz Trucks and Gianenrico Griffini, President of the "International Truck Of The Year"
Its all-new OM471 12.8-litre in-line-six engine comes with a pressure-ampli?ed common- rail injection system and an asymmetric inlet turbocharger. It also features a highly- sophisticated engine thermal-control system that includes electrically-actuated radiator shutters. The latest design of instrument panel and dashboard also ensures an extremely user-friendly man-machine interface. The evolutionary aspects entail updated cab interiors and layouts with colour-code separation between the working (driving) and living areas. Moreover, the New Actros fairly bristles with safety systems, including a second generation radar-controlled active brake assist device, capable of detecting stationary obstacles in the path of the truck and bringing the truck to a complete stop without the aid of the driver. Having already tested the New Actros twice this year, the ITOY jury was particularly impressed by its ride-and-handling which set a new benchmark in the heavy-duty truck sector. Also, Mercedes-Benz's decision to offer its Fleet Board telematics system as standard ensures a driver receives direct feedback on their driving style, thus reducing fuel consumption as well as CO2 emissions - and this will be a critical issue for commercial vehicles in EU over the coming years. Summing up the ITOY jury's vote, International Truck of the Year chairman Gianenrico Grif?ni commented: "Mercedes-Benz has delivered a new heavy duty truck that's both revolutionary and evolutionary and one which, above all, has demonstrably 'raised the bar' in heavy truck ef?ciency and comfort."